Nothing beats a mid-week staycation, especially during a busy few weeks. It’s a reprieve from the craziness of life whether you need a break from the office or the kids. Earlier this week, I shared a part of a recent mid-week staycation that I had the pleasure of enjoying. The Chicago Lincolnshire Marriott Resort invited me to dine at the newly redesigned and reconcepted Three Embers restaurant which was a treat in itself. They also invited me to stay the night which was a no brainer. I invited my cousin to come along and it served as a mini celebration of sorts for her earning a Masters degree. The resort recently went under a $25 million transformation from completely redesigned restaurants to a gorgeous outdoor patio. It’s an oasis in the Chicago suburbs and an ideal landscape for anyone looking to escape the fast-pace of city life and take a moment to breathe. The Chicago Marriott Lincolnshire Resort is tucked away on a large campus that is home to the resort, the Marriott theater, an on-site farm, greenhouse, and apiary, and more. The secluded location guises the fact that you’re in suburban Chicago. The entire property is surrounded by forest area and the grounds are expertly landscaped. My cousin and I were running late for the Three Embers dinner so we had to take it in rather quick. We entered the lobby which has plenty of space and comfortable seating for lounging, and checked in seamlessly. The front desk staff was welcoming and very helpful in providing information about our room and stay. We passed the full-service Starbucks Cafe, new to the resort, and doors to the outdoor pool before going up one floor to our room. We stayed in a double room with full-sized beds and were greeted with a little note and a few chocolatey treats upon arrival. There was plenty of space for two of us with a desk and small seating area. The bathroom was clean with a modern design and plenty of counter space. A large window overlooked the resort grounds. I’m so used to city views whenever staying in a hotel. It was refreshing to have trees and all kinds of green on the other side of the window. The beds were unbelievably comfortable. In fact, when we were checking out, I asked if we could take the bed with us. It was like a pillowy cloud but still firm enough so that your back didn’t ache in the morning. Simply put, everything exceeded our expectations. What do you think $25 million could get you? Other than not having to work for the rest of your life. For the Marriott Lincolnshire, it got them a completely transformed resort. They added two new restaurants: Three Embers and Wrights Brew & Bistro, a full-service Starbucks Cafe, a new day spa - The Spa at Lincolnshire, completely renovated guest rooms, an upgraded “Great Room” lobby, and the Lakeside Plaza. It seems like a lot and it is. You can tell a lot of care and consideration went into each of the changes and the money was well spent. The Great Room serves as the lobby and so much more. With the Starbucks Cafe right off the Great Room, it’s the perfect location to take your computer, grab a latte and scroll through your emails in the morning. There’s enough foot traffic to make it feel alive but not in an overwhelming way so that you can’t hear yourself think. It gives a grand first impression to anyone arriving for the first time as well. I did not experience Wrights Brew & Bistro but we had a lovely dinner at Three Embers which started on the Lakeside Plaza. The plaza is a 2,500 square foot patio featuring breathtaking views of the resort lake, fire pits, outdoor seating and more. It’s the ideal spot to start the night with a cocktail in hand. Tuesdays and Wednesdays during the summer, Lakeside Plaza features live acoustic music performances to add to the ambiance. We were able to enjoy one of those performances and it was nothing short of fantastic. The menu at Three Embers features Midwest cuisine with simple, locally grown and sourced, farm-fresh ingredients, while integrating influential flavors from various regions throughout southern Europe. Get a more in depth review and look at Three Embers by visiting our post from earlier in the week. 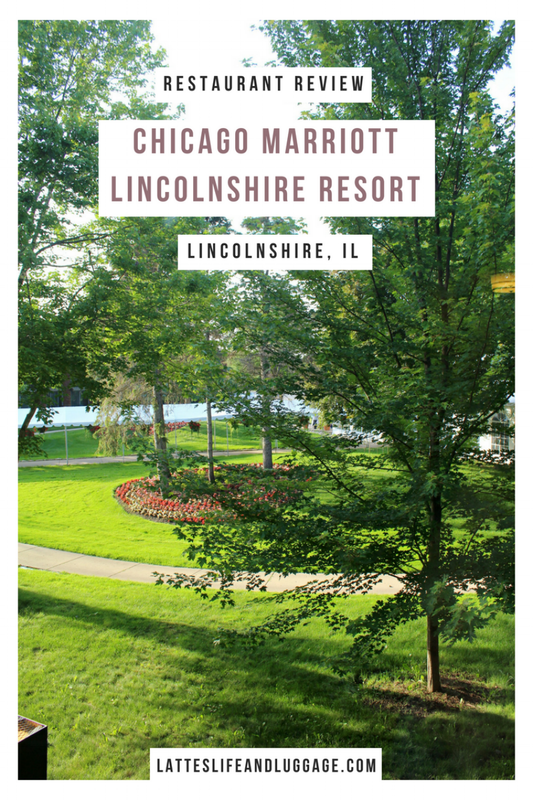 We only stayed at the Chicago Marriott Lincolnshire Resort for one night but it was long enough to give us a taste of what the hotel has to offer. Growing up in the suburbs of Chicago, I have experienced many of the suburban hotel options and none of them live up to what the Marriott Lincolnshire provides. Because of its secluded location, even in the heart of a suburb, it actually feels like you’ve escaped into nature to get away for awhile. It’s ideal for anyone looking to take a staycation within the area but it’s also a great spot for those visiting from out of town. Lincolnshire is less than an hour from Chicago by car or a quick drive from the nearest Metra stop to take the train into the city. It’s also a quick 20 min drive to O’Hare International Airport, which, if you’re familiar with O’Hare - there are few places that can be considered quick drives. Overall, the Marriott Lincolnshire has plenty to offer including live theater performances. If you’re traveling to the area, I would recommend to at least consider allowing the resort to host you during your visit.